Lee Ross and Rebecca McKinnis will join the cast of Everybody’s Talking About Jamie at the Apollo Theatre next week, as original London cast members Josie Walker and Phil Nichol leave their roles. TV star Ross is best known for his roles in EastEnders and The Catherine Tate Show, and will take on the role of Jamie New’s mentor, Hugo, while McKinnis, who currently understudies Margaret New in the cast, will step into the main role, both from Monday 16 July. The rest of the cast continue in their roles, including Olivier Award nominee John McCrea in the title role. Nica Burns, Producer of Everybody’s Talking About Jamie, said, “It’s a big milestone saying goodbye to two of our terrific leading actors, Josie Walker and Phil Nichol. Josie has played Margaret New superbly from the very first workshop four years ago and Phil has brought his wonderful comic touch to the role of Hugo/Loco at the Apollo. 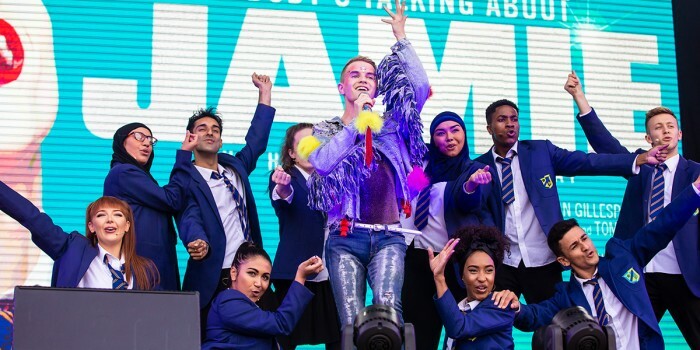 Feelgood musical Everybody’s Talking About Jamie originally opened at the Sheffield Crucible in 2017, transferring to the West End’s Apollo Theatre later that year. The show is currently booking until 6 April 2019. As well as receiving 5-star reviews aplenty, Everybody’s Talking About Jamie was nominated for 5 Olivier Awards and won the UK Theatre Award for Best New Musical. Book Everybody’s Talking About Jamie tickets here! Everybody’s Talking About Jamie is also participating in Kids Week; throughout August, a child aged 16 or under can go free when accompanied by an adult paying full price. Adults can also purchase up to two extra children’s tickets at half price, and there are no booking fees to pay. Kids Week 2018 now on sale!